We made it through the Great Polar Vortex of 2019 relatively unscathed. How cold was it in Minneapolis? It was so cold that the university campus where I work closed early on Tuesday, closed completely on Wednesday, and had a late opening on Thursday. Minnesotans are hardy folk so this was a great and welcome surprise. The temperature Wednesday morning was -28F/-33C with a windchill of -53F/-47C and I am grateful I did not have to venture out to catch the bus. Even with the late start on Thursday, it was still -25F/-31.6C when I caught the bus. I was so layered and bundled up I was virtually unrecognizable. The only things showing were my eyeballs and if I could have covered those up too I would have! James was not as lucky as I was and had to go to work on Wednesday. Except the car wouldn’t start. He called all the local car repair garages and the ETA for a jump was 3-4 hours. And then there would be no guarantee the car would start when it was time for him to come home from work. So he took a Lyft for the very first time. Super convenient and his driver was really nice and delighted to be the hero of the day for so many people. James had the day off Thursday and could wait a couple hours for someone to show up to jump his car. When they did, it started but there was no charge in the battery at all. So James drove it to our preferred mechanic a few blocks away and waited in the warmth while they installed a new battery. New car batteries have gotten outrageously expensive. They used to cost around $80 and now they are double that. Ouch. All I can say is, that battery had better last a long time. The Dashwoods were troopers. We turned the heat lamp on in their coop Tuesday afternoon and kept it on until Friday morning. They suffered the indignity of having their combs and wattles vaselined not once, but twice. We plied them with snacks of hot oatmeal and hot soybean mash, scrambled eggs, and cracked corn. They took it all in stride. Of course now that the temperature has moderated they are wondering why we have stopped with all the extra yummy snacks and how dare we turn off the heat lamp. They looked at me last night as if to say, what sort of establishment are you running here lady? I am sure they will drop my Yelp rating from 5 to one star so it’s a good thing they don’t have thumbs or the internet. James and I ventured out for a grocery shop last night and the 15F/-9.4C temperature felt fantastic! Hey, it’s all relative. Extreme cold wears a person down and we were tired, but still determined to make a zero waste shopping effort. And we succeeded! The only waste from the shop came from the plastic stickers on our produce. The kale and bunch of radishes we bought also were held together with twist ties, but we will be re-using those in the garden to tie up plants when summer arrives so many months from now. I decided to not buy any yogurt in big plastic tubs anymore. Until six months ago I actually rarely had any but began buying a big tub to divide up into smaller jars to take to work for an afternoon snack. Yogurt seemed like a good way to add in some extra protein to help fuel all my cycling. I wish I could say the fermented oat flour “yogurt” was a success. It was, in that on our second try we got the flour-water ratio right, and we got it to ferment. But yuck. It tastes like sour dough and is not a good yogurt alternative. However, it might actually make a good sourdough starter so that’s something we might experiment with. We are going to give yogurt making one final try. Allegedly we can heat the oven up to 150 degrees (F), put the yogurt mixture in, and then turn off the oven and not open the door for 8 hours. After 8 hours we will open the oven door and find a magical transformation has occurred. We’ll see. But I have also decided that since I began eating so much yogurt for the protein, I can just as easily make chia pudding for a high protein afternoon snack. I love chia pudding, the swollen chia seeds remind me of tapioca, which I also love. After experimenting with two potential toilet paper selections we have chosen Bim Bam Boo. It’s a smaller roll than the toilet paper we regularly bought but it seems to last just as long because you don’t need to use quite as much. It’s kind of expensive though and I am wondering if getting TP through Who Gives a Crap would be a better option. Their TP is eco-friendly and priced well and half their profit goes to building toilets and improving sanitation in developing parts of the world. But, you have to buy a box of 48 rolls at a time. Where does one store 48 rolls of TP? We go through about 2 rolls a week at my house which means a box will last me around three months. And then there is the question of carbon expenditure. Is it better to buy three or four smallish rolls when I go grocery shopping or have a big box of jumbo sized rolls shipped to my house? Anyone know how to work that one out? The purchase we were most excited about was shampoo bars. Our co-op turned out to have so many to choose from, it was weirdly exciting. James chose an herbal one made with borage. I went for the SunLeaf brand. This stuff is made with 100% plant-based ingredients. They had such a variety of flavors it was hard to choose. I am hyper-sensitive to floral scents so the rose and lavender bars were out. There was one that was cedar and mint that smelled so earthy and lovely, another smelled lemony, another James thought smelled like Christmas trees. There was cinnamon too. My nose stopped working after sniffing three of them so I ended up going with the first one I sniffed, orange-ginger. I can’t wait to give it a try. Both of the bars we bought come in a flimsy paper box so 100% recyclable. Yay! We are feeling pretty pleased with ourselves. Waldo and Dickens have not objected to the Okocat pine pellet litter. We have eliminated all sorts of plastic, found some great new products that are both cheaper and better for us to replace ones we usually bought. A few items are a bit more expensive but I think it comes pretty close to even when all is said and done. The hardest thing has been not buying frozen vegetables or fruit. I miss having corn and green peas. And while we didn’t buy frozen fruit very often, it has always been a nice treat to buy frozen blueberries now and then in the middle of winter and make blueberry pancakes and blueberry muffins. I still have lots of rhubarb in the freezer from last summer though. Not the same as blueberries, but I think I will task James with figuring out how to make a tart and tasty rhubarb pancake and some kind of rhubarb muffin or scone. Rhubarb is technically a vegetable, but it still tastes like summer and that’s exactly what a girl needs to lift the spirits in the aftermath of a polar vortex. I have never heard of shampoo bars, I suspect they may not have reached us yet. For some reason tapioca has become unobtainable here so maybe I should try chia seeds to make a pudding. It has been -6 celsius overnight but with the wind chill it’s lower than that – and that is bad enough. I’m glad you’re thawing out a bit. I tried making yogurt in a thermos flask but it didn’t work. Pining, I had never heard of shampoo bars either until recently. Very sad about the tapioca. I hope it makes a return soon. Chia doesn’t taste like tapioca but the seeds puff up when they absorb liquid and gives them a very similar texture as tapioca pearls. I have never heard of making yogurt in a thermos. Good to know it didn’t really work so if I come across instructions for it I won’t bother. I hope you have warmed up a bit! You are doing amazing at no-waste grocery shopping! Laila, Glad I gave you a laugh! Really pleased with the zero waste grocery shopping. It is easier to do having such a great place to shop at like my co-op. Here on Long Island the coldest it got at my house was about 5 degrees Fahrenheit. Hopefully we have had the last of it. I am curious to hear how your yogurt making goes. It might be something that I would like to try. Have made an attempt at the yogurt yet, but will make sure I post about it when I do. I sympathise with the Dashwoods. Within reach of paradise and then to have it snatched away… I made my own deo the other day in an effort to reduce plastic waste. wonderer, heh, yeah the Dashwoods have still only partially forgiven me. They really know how to hold a grudge! Deo – deodorant? Nice work! We make our own too with coconut oil, baking soda and potato starch. Cheap, easy and it works really well. Plus it doesn’t give me a rash like so many store bought ones do. It was pretty cold here, too- we had a pipe freeze but luckily I thawed it out before dark on the worst night, and have kept it dripping since. Today it was 40F- felt quite balmy! I did have to cover up some plants in the yard I was afraid of loosing to the chill- especially my new camellia. Your chickens are pretty funny! Glad they’re surviving the chill in comfort. 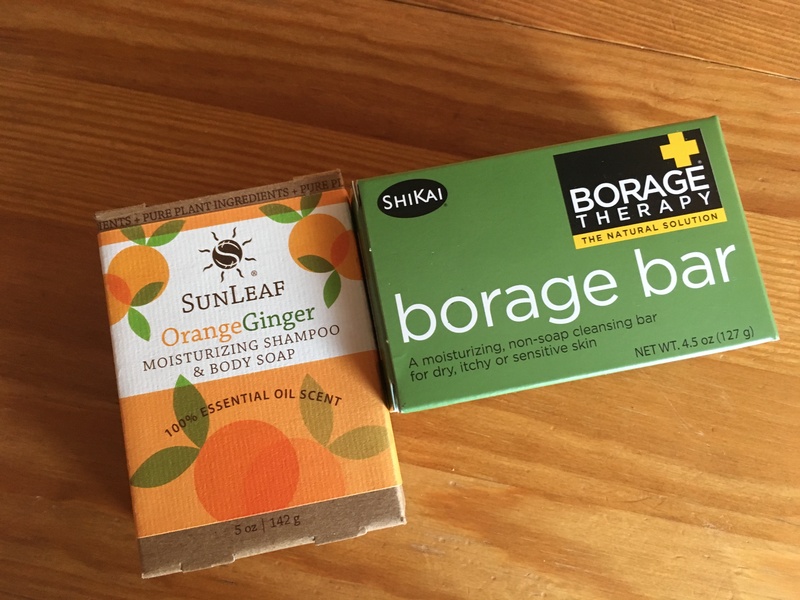 How does the borage bar smell? I grow borage in my garden- great plant- because it seems to keep the squirrels out. The flowers are very pretty but I’ve never noticed the scent myself. I am really looking forward to eating rhubarb out of my garden for the first time this coming spring. I bought it three years ago, but after the first year made a sudden decision to transplant it to a diff spot- so had to wait another year. Oh no Jeane! I am glad your frozen pipe didn’t burst! I hope your camellia is ok. I envy that you can grow them, they are so pretty! The borage shampoo bar doesn’t actually smell like borage. I had left James to pick his own and later when I was looking at it and could smell it, it smells kind of like coconut. I looked at the ingredients and it just says “natural scents” which could mean anything. I have borage on my garden too but have never smelled it since there are usually bees on it. wish mine kept squirrels away! This last summer was the first time I was able to harvest rhubarb. And wow, did I get a lot from one small plant (3 years old)! Pretty amazing. I like the tart so probably won’t add much sweetener, just enough to take the edge off a bit. I hope you get lots in your first harvest! Amazing news on the zero waste shopping! Glad to hear you found wood based litter for the cats. I’m interested to hear about your yoghurt making. Have you heard about yoghurt making using a thermos? Then you don’t have to use the oven. I have a thing called an Easi-yo which is a large insulated tub: you just fill the end of it with boiling water, put the milk and whatever else you’re using in a container inside it, and leave it be. Works pretty well and makes a litre of yoghurt at a time. The object itself is made of plastic sadly but as it isn’t single use I try not to feel too bad about it. I imagine the design is based on an older, more traditional approach using maybe crockery pots. I’m about to attempt homemade coconut yoghurt: unfortunately neither soy nor oat milks agree with my digestion. Thanks maggie! Rhubarb and marzipan muffins sound incredibly decadent! The yogurt making is a bust. Either our house/oven is not warm enough or the vegan yogurt starter we buy at our co-op doesn’t work. Or we don’t work 🙂 All of these are possible. So no more yogurt on a regular basis. That’s ok. I’ve been having chia pudding and that too is quite tasty. I have never seen a yogurt making thermos before but I think at this point we are done trying to make our own. Good luck with your coconut yogurt! I cannot imagine that kind of cold. Then again, remind me about this when I’m complaining about our summer heat. You are doing so well on your zero waste adventure. Let us know what you think of the shampoo bars. I don’t like a lot of scents in my bath & body products and it’s amazing how many “natural” products are so heavily fragranced.